I am out on annual leave this week, so HF will be ABBREVIATED. 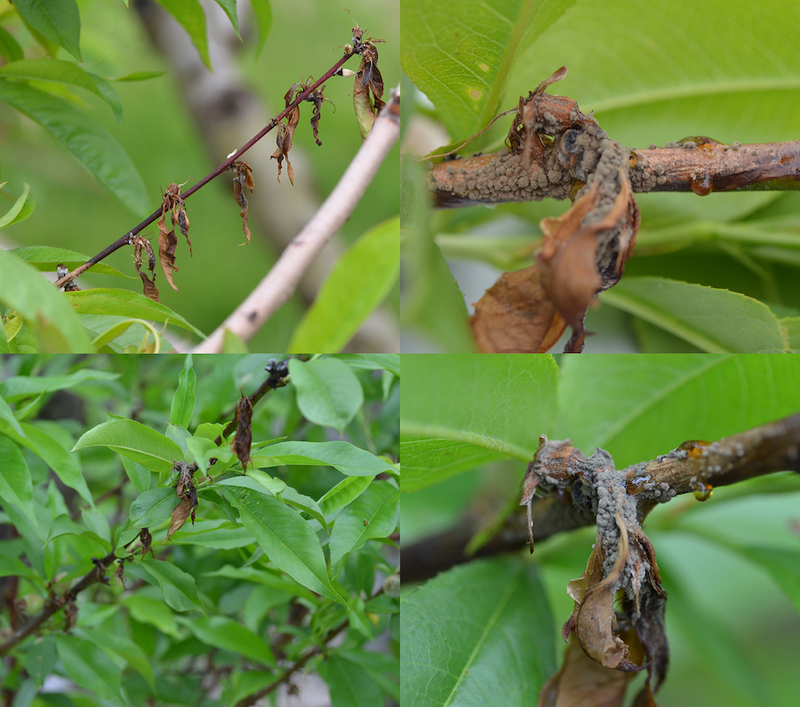 I am hoping Dan Cooley will contribute something to DISEASES, but there appears to be a particularly nasty outbreak of brown rot at the UMass Orchard, in particular on some peaches and nectarines. (See pictures below.) I will have to admit that shading of the lower canopy may be a contributing factor, but also last year was a very LOW SPRAY program on peaches and nectarines because of the lack of crop. This situation is most prominent in a new variety evaluation (numbered selections) block, so variety may be a factor too. I would be curious if anyone else is seeing this? Brown rot must be lovin' this weather! You may also want to see Scab Lesions, Fire Blight Ooze, Captan Injury, Summer Rots from the Acimovic Lab blog. Also, I'm hoping Liz Garofalo will contribute something for INSECTS when she gets done scouting a few orchards mid-week. 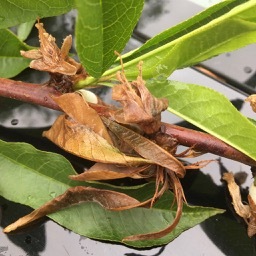 But also see link in Guest article for excellent codling moth discussion. Bloom is over (with the exception of a few possible rattails here and there), that doesn’t mean pollinator protection concerns are at an end. 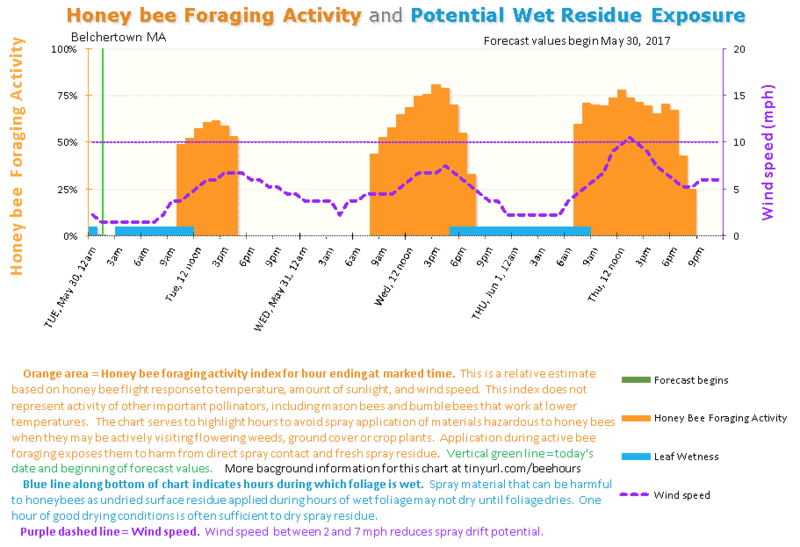 AgRadar continues to provide an excellent resource for honeybee activity conditions (and many other interesting things as well). One thing you can do without a model of any sort to protect the pollinators in your orchard and reduce pressure from certain pests is mow (often) between rows, removing blooms from dandelion and other orchard floor plants. Additionally, this time of year, solitary nesters are out and about foraging for themselves and their offspring. Taking care to minimize drift into unmanaged habitats surrounding orchards will reduce non-target exposure to harmful materials. Making sure your sprayer is properly calibrated will not only help you reduce unwanted drift but also potentially save on material costs. Of course selecting materials that have a lower honeybee toxicity rating can’t hurt. Materials like Centaur, Movento and Esteem have lower toxicity ratings (“very low” according to EPA toxicity classifications) whereas materials like Entrust, Delegate and Imidan carry a “high” toxicity rating. Scab. The rain that we are having now, Monday and Tuesday, is a major infection in the colder, latest orchards in MA. In eastern MA, the scab risk is generally moderate, while in the warmer parts of the Connecticut Valley, risk is low to moderate. 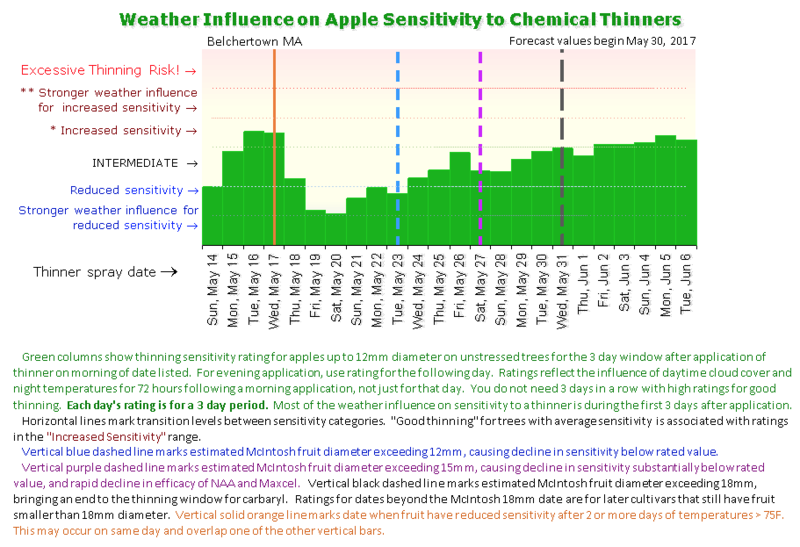 This rain will end primary scab season in the Connecticut Valley, but risk from predicted rains over the next week is forecast to be moderate in the East and high in late orchards. 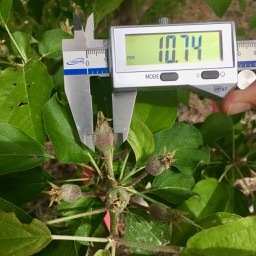 Ascospore maturity estimates by RIMpro and AgRadar continue to match Liz Garofalo’s laboratory observations. Spore loads have dropped significantly over the past week: from about 20% to 2%; eastern MA from 15% to 5%; and in the later areas such as Ashfield, from 50% to 15%. As we said last week, NEWA has said all ascospores were matured and been released over well over 10 days ago in all parts of MA. Spore captures from Deerfield MA from two weeks. 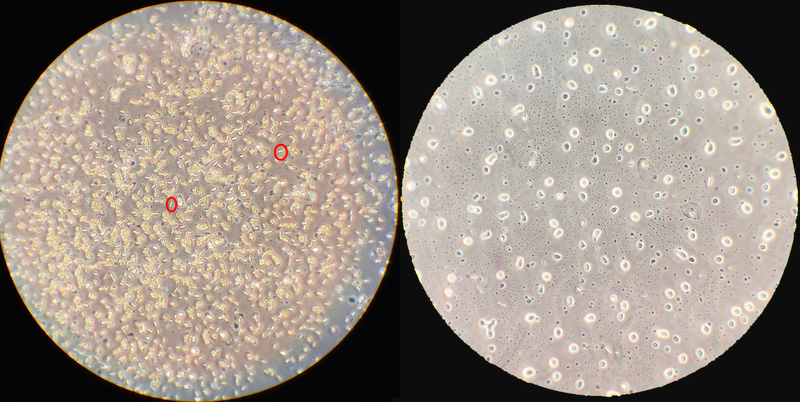 Last week, May 23 (left) shows abundant ascospores, with two typical spores circled in red. This week, May 30 (right) has no visible ascospores. Secondary scab is clearly visible at this point. In orchards where infection occurred any rain at this time carries a significant risk of more scab infection. The picture below shows two types of scab infection. On the left is a picture of a scab infection that started early, at tight cluster, where the lesions have darkened. Fungicides have “burned out” these infections, which means they are no longer producing spores. The picture on the right shows active scab lesions, producing spores on more recently emerged leaves. These are the dangerous infections, and they’re harder to see. Scab lesions. Older burned out lesions on the left, and new active lesions on the right. The answer is that there is, because the fungus can survive in other tissue besides old mummified fruit. The evidence showed up in one of Jon Clement’s variety trials this week, in the form of brown rot blossom blight. This is the stage of the disease that gets into blossoms, and then into wood. Twigs can be girdled and the blossom infections produce inoculum that will rain down on ripening fruit as they develop. These infection should be pruned out during peach thinning. If not, it will make brown rot management on fruit that much more difficult. 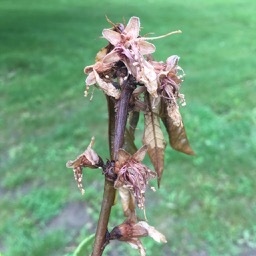 Peach brown rot blossom blight that has progressed to twig blight. Gray spores are clearly visible in close-ups on the right. The desired crop load on these trees was decided to be 50 fruit (they are kind of short!) so there is a long ways to go for 10% fruit set (based on the potential of 500 flowers/fruits per tree to start). The decision was made to apply 6-BA at 100 ppm plus carbaryl at one pint on 28-May. We will see what happens. I will say, these three varieties had great bloom and appeared to be setting a lot of fruit. McIntosh seemed to be thinning down a little better, however, there was some variability observed there too. (I don't do McIntosh anymore :-)) What are you seeing out there? Certainly the weather has not favored strong thinning (yet). See chart below from AgRadar. Rumor has it fruit is not coming off readily, however, there is still some time for thinners applied last week to work. Don't panic, but if you do, and if you did not notice any significant tree drooping with your last NAA application (too cool? ), you might want to get out there with another application of (particularly) NAA soon before the fruits get too large. "We have had very poor thinning weather to impose stress since last publication. Growers will undoubtedly want to consider thinning in blocks that are still heavy. Since we have had very little stress I suspect that we may have a wider thinning window of opportunity. I also suspect that growers will have to thin more aggressively and probably out of there comfort zone to get the job done. The weather forecast for the next 7 days does not favor thinning." 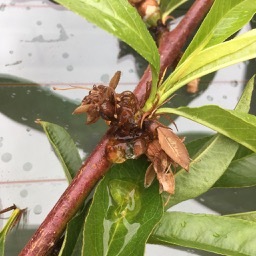 Please read this timely and excellent discussion on codling moth (CM) on The Jentsch Lab blog. The next Healthy Fruit will be published on Tuesday, June 6 or thereabouts, 2017. As always feel free to get in touch with any member of the UMass Fruit Team (http://extension.umass.edu/fruitadvisor/team-members) if you have questions or comments.